I have tried several, and they all failed within a year. 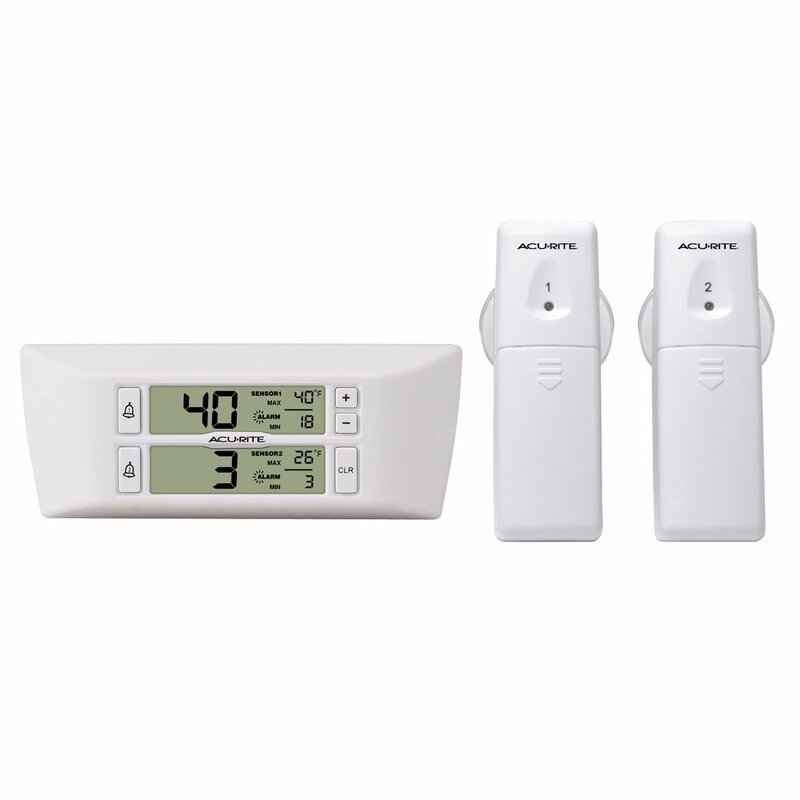 Looking for one where the sensor is placed in the cold spaces, and the display can be mounted nearby in the galley to show the fridge and freezer temp. A reset to clear the old temp history would also be helpful. I would like to purchase a good one that will last awhile. I just saw a write up on this and seems to work good. Giggitoni has one of these that I admired. Bought one over a year ago and it's been great. It has alarms for high/low temps and history of highs and lows since reset. Magnets hold it to the fridge door. I use one sensor for the upper fridge and the other for the lower fridge. Not bad for under $25. The easiest way to monitor the environmental conditions affecting the things you care about. Bluetooth to your smartphone. I ended up buying the small sensors that are monitored via a Bluetooth App on a phone/iPad. I have 4 cold spaces to keep track off, so this should work well. Please advise what/where you got your monitors. And let us know how it’s doing in 6-12 months. I know I’m interested and probably many more. I use the accurite flywright mentions. Last about 2+ years. Usually moisture from fridge condensation gets it. But easy and cheap to replace. Also has programmable audible alarms. I have been using Sensor Push on the boat and at home for 2 years now. With the wifi gateway you get alerts on the phone and can review history. Another Accu-rite user. The readout is mounted on the cabinet with a piece of Dual Lock, it's very handy to glance at & see instantly what temps are. It has a high-low readout and programmable alarms. One for fridge, one for freezer. Works perfectly. And inexpensive! I wouldn't want to have to futz with the phone and an app just to see the fridge temp, that just seems cumbersome. I've been using digital ones with a probe for about $1.50 on eBay. Sure, the cord does break the seal somewhat but I doubt enough to make a difference. I wonder if putting the sensor in a ziploc or vacseal bag would help? Mine are not in a plastic bag. Good idea, though! Had them for about seven or eight years and only periodically change batteries. Steve Dashew used to sell recording units as used in reefer trucks ,that will allert you to a warming period. I freeze a small cup of water then place a penny on the frozen surface. If I penny sinks I know there was a failure. I have had the stainless lobster mentioned in #2. It’s worked well, configurable and senses when on 120v when It can then run colder, all configurable. I do find that it saves on amp hours. I have it mounted on the side of a cabinet above the frig. I can see the frig temp, ambient temp and amp hours consumed in the last 24 hours (usually about 90 in the summer). It’s a great device to manage and keep track of what is often my biggest electrical load and much more efficient than the old style thermostat that it replaced. I used to listen to the frig start, then stop a few minutes later, then start again. No more. Update: the sensor in post 3 failed, twice, so I purchased the sensors with blue tooth monitoring in post 4. Very nice. I like data, so it’s cool to see the past info. Two thumbs up. Sensor Push App. Just a couple pages of many available. I love the sensor push. Moved it to the house while we are waiting for the new boat to arrive. For the new boat we will be installing a Siren Marine boat monitoring system. Have it setup in the living room now. I will have 2 hard wired temperature sensors. 1 in the Fridge, 1 in the Freezer. And 2 wireless temp sensors. 1 in the engine room and 1 in the Saloon. You get a detailed chart of the temperature history for 1 hour, 1 day, and 1 week. I dont have the sensor hooked up yet, but the chart below shows the battery voltage which looks the same for the temp. You can setup different values to trigger alarms and get text and email alerts. The system is connected via cellular so no dependency on wifi if the power goes out or internet goes out. 1 spoiled fridge was enough for 1 lifetime for me! I've been playing with some home automation stuff. It seems like a lot of it would work well on the boat, too. The "brain" of my system at home is a Raspberry Pi running the open-source Home Assistant software, although I've been testing OpenHAB, too. If you don't know what all that means, let's just say it's all a fraction of the cost of a regular home automation system, never mind a "marine" monitoring system. There are a number of protocols that sensors commonly use, but standards have emerged, making them mostly inter-operable. Besides IP, I have a USB stick plugged into the RPi which gives me the two other common protocols, Z-wave and Zigbee. So I can basically monitor and control most "smart home" sensors or switches out there. No need to buy overpriced, proprietary components. If I connected that to either a marina WiFi or a cellular modem, I could do most anything the boat monitoring systems can do. There's a lot of work being done in the area of interfacing CAN Bus to these open-source smart home devices. Since NMEA 2000 is based on CAN Bus, it seems like it might be possible to integrate some of that data some day, too. I would be happy with a fridge light that worked. As the offishul TF Cheapskate, I love these cheap solutions.